Home » Free » Temporary » Go Go Rauone-san! http://www.line-stickers.com/ – Go Go Rauone-san! 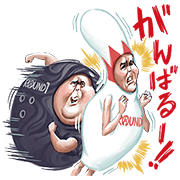 Line Sticker | Round1 debuts its first sticker set featuring their popular character Rauone-san! You canʹt get them down! Theyʹll make you look at bowling in a whole different way and turn your conversations into a strike! The 2nd edition of stickers from Round1ʹs original “Rauone-san” character is here! This pin wonʹt drop! Friend the Round1 official account to get the set! Available till February 2, 2015. The 1st set is also super popular. Visit the Round1 website for more info!